Valmiki's Ramayana, containing 24,000 verses is a world famous epic and is justly called the very first of Sanskrit poems. The Adhyatma Ramayana, the spiritual version of the same Rama Saga, though not so well known for poetic excellence, is none the less equally important in several other respects. 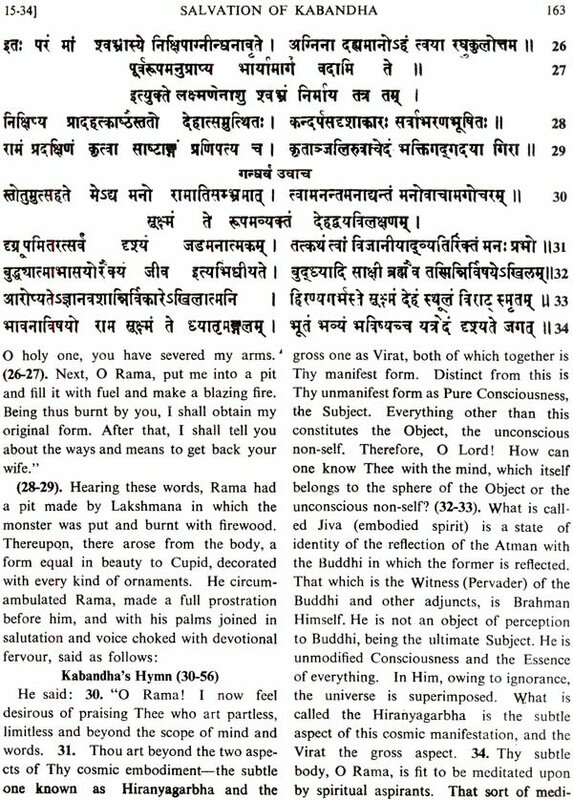 Here you get in the much shorter compass of 3643 verses, the whole of Rama's story placed in a spiritual setting. Here Rama is not only a great personage, an exemaplar of the highest ideals of Dharma, but very God, the divine Incarnate. Revealing and fully remembering his spiritual glory and bestowing salvation on all who come into intimate contact with him. Thrilling and evocative hymns, discourses on high spiritual themes, philosophical dissertations and directions for spiritual practice appear in every pat of it. Besides the instruction they convey, these sections contribute immensely towards the devotional edification of those who adore Rama as their favourite Deity. What the Bhagavata is to Krishna, that the Adkyatma Ramayana is to Rama in revealing his spiritual excellence. It is therefore a text used for daily devout study. The personalities of Rama and Sita have become so deeply embedded in the minds of the Indian people that their story has found expression in the form of several Ramayanas. Some of these are: Valmiki's Ramayana, Adhyatma Ramayana, Vasishtha Ramayana, Ananda Ramayana and Agastya Ramayana in Sanskrit and Kamba Ramayana in Tamil, Tulsidas Ramayana in Hindi, Kirtivasa Ramayana in Bengali and Ezuthachan's Adhyatma Ramayana in Malayalam. 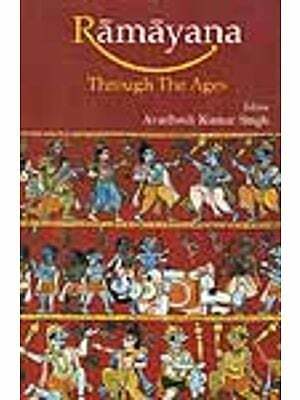 For all these works on the Rama Saga, Valmiki's famous epic on that theme is the basis. But according to the fundamental objects, which the poet-devotees who composed the other Ramayanas had in mind, they have introduced many changes from Valmiki's composition. But all of them directly or indirectly pay obeisance to Valmiki's grand epic, which is called the Adhikavya (the primeval poem) in Sanskrit, and its author the Adikavi (the first of poets). In an Introduction to the Adhyatma Ramayana, we have necessarily got to make a study in brief of the main difference between this text and Valmiki's epic. Valmiki's object seems to have been to describe an ideal human character, namely that of Rama, though he accepts Rama also as an Incarnation of Mahavishnu. But the divinity of Rama is kept in the background, although all through the narrative there is an attempt made to refer to that also symbolically as explicated by many interpreters of Valmiki Ramayana. The direct object of Valmiki's epic is made plain at the very beginning of that text in verses 1 to 18 of Chapter I of the Bala Kanda. It reads as follows: (1) "Once in all humility the austere sage Valmiki asked sage Narada, who was ever engaged in Tapas and Vedic study and who was the most noted among the knowers of the Vedas, the following question: (2) Who in the world today is a great personage endowed with all virtues, who is courageous, who knows the secret of Dharma, who is grateful, who is ever truthful and who is established in sacred observances; (3) Who has great family traditions, who has got sympathy for all creatures, who is most learned, who is skilful and whose outlook is ever kindly; (4) Who is courageous, who has subdued anger, who is endowed with splendour, who is free from jealousy, who when angry in the field of battle is a terror even to the Devas (5) I am interested to know about this. My desire to know is intense. O sage! You have the capacity to know the real worth of a man. (6) "Being greatly pleased at these words of Valmiki, Narada the sage with the knowledge of the past, present and future, said, 'Listen', and began to give his reply as follows: (7) 'O great sage! The virtues that you have pointed out are many and very rare to be found in people. So I shall be giving you my reply after due deliberation. You now hear from me who that person is who is endowed with the qualifications mentioned by you. In the line of Ikshvakus, there was a prince named Rama who was very famous among men. He was possessed of self-control; he was powerful; he was endowed with splendour; he was firm in his resolve; he had the capacity to bring all under himself and govern. (9) He was highly intelligent and just; he was an accomplished speaker and possessor of all wealth. He was the dread of his enemies; he had sumptuous shoulders, long arms, conch-like neck and fleshy cheeks. (10) His chest was broad and collar bones invisible. He was the most noted of archers and a queller of all his foes. With arms extending upto the knees, his head and gaze were extremely charming. (11) His vision on them. So also men are deluded by superimposing on the Supreme Self egoistic actions of their own I-sense (Ahamkara), which in combination with the body and the senses assumes the role of the doer.) (23) In the sun, who is of the nature of unobstructible and changeless luminosity, there can be no day and night at any time. In the same way, in Rama, who is the Supreme Being Hari, who is the condensation of Pure Consciousness-how can there be knowledge and ignorance, the two changing states observed in limited centres of consciousness? (24) Rama, the noblest of the Raghus, is of the nature of Pure Bliss and Pure Consciousness that has no rise and fall. That lotus-eyed Lord is the witness of Ajnana (ignorance) and not a victim of it. Maya, the power of ignorance, is dependent on Him and therefore can never cause Him infatuation and ignorance." 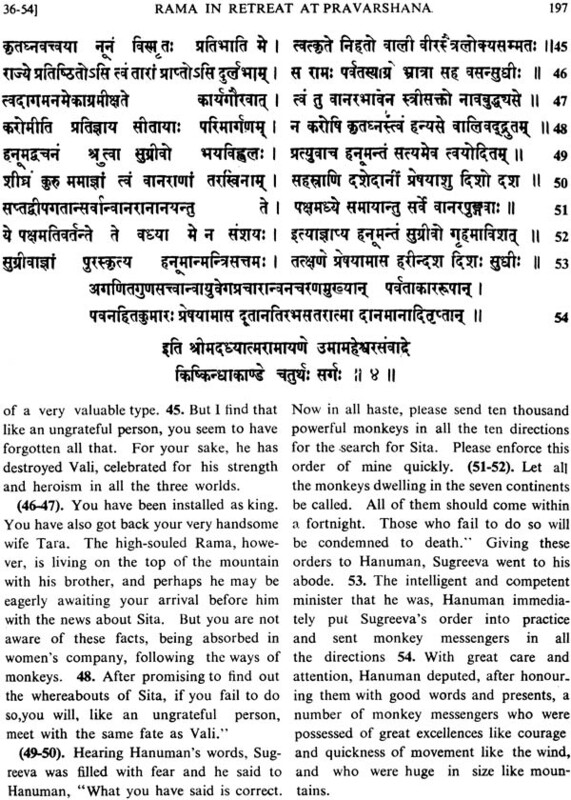 A few verses after this we get a pointed statement of the above ideas in the following verse addressed by Sita to Hanuman. Sita says: (32) "Know Rama to be the Supreme Brahman, the Existence-knowledge-Bliss Absolute and the One without a second. He is Pure Existence devoid of all adjuncts, whom the senses cannot perceive as their object. (33) Know Rama as Pure Bliss, as devoid of all impurities, as peace, as changeless substance, as free from the stain of ignorance, as all-pervading Spirit, as devoid of all disvalues and as the revealing Consciousness. (34) Know me to be the primeval Prakriti, the material and instrumental cause of the creation sustentation and dissolution of the universe. In the mere presence of Rama, the Supreme Brahman, I, His Prakriti or Power, create the universe unwearied. (35) What I create in His mere presence, the explains what it is that is thus superimposed, and in doing so narrates in brief the incidents of Rama's life and concludes, saying: (44) 'Rama walks not' He sits not; He sorrows not; He abandons not; there is no trace of any activity in Him. Being pure Bliss itself, there is no movement, n transformation in Him. As He is the substratum of Maya, the changeful Nature of His, He underlies all these transformation of the constituents of Maya, and for those who cannot distinguish the substratum from the constituents of Maya, He seems to get transformed, whereas it is only the constitutents of Maya that undergo transformation." Now this elaborate quotation makes plain that the object of Adhyatma Ramayana or the 'spiritual version of the Rama Saga' is to project Rama directly as the Supreme Self. But while doing so, the text takes care to see that He, who is the non-dual and uninvolved Self, is also the Personal Deity, the Supreme Isvara, who is to be adored and prayed to by all those who seek the knowledge of Non-duality described above. Bhakti of the most intense type is therefore taught, and it is also stressed that through devotion to Rama alone the saving knowledge would dawn in the Jiva. It pointedly says in verses 45 to 57 of the first chapter of Balakanda, well known as Sri-Ramahrdaya, "A devotee of mine who understands the Supreme Truth is fit for My Status. On the other hand, one who ignorantly engrosses himself in the search for this knowledge in the pit of scriptural texts without any devotion to Me, never attains this knowledge of My nature. They will not have liberation too even in a hundred life spans." And further it is said, "This knowledge, which is superior even to the attainment of the heaven of Indra, should not be imparted by you to any conceited man who has no devotion to Me." (Ch. V. 53). Thus the teaching of the Adhyatma-Ramayana is only an elaboration of the declaration of the Svetasvatara Upanishad, "It is only in one who has supreme devotion to God and to his spiritual teacher that this Truth (knowledge of the non-dual Self), when taught, will shine." Sri Ramakrishna also emphasizes this aspect of spiritual life in a beautiful parable. "Suppose a noble man has a big garden which he places under the care of a gardener. The gardener works hard and produces excellent fruits and vegetables all the year round. The master at last, in course of time, gets so highly pleased with him that he keeps him on his own seat and tells him that he is his own self. In place o seeking that place by the master's side by pleasing him through devotion, if he were to sit on that seat out of pride and greed, he will only be pushed away from it. Thus through devotion alone this Supreme knowledge is obtained." The Gita also declares: "Being gracious to those who are thus firmly devoted to Me, I destroy the darkness of ignorance in them, lighting the lamp of wisdom in them by My presence as their very self." (X-11). Thus to establish Rama's divine status as an object of worship and devotion and to teach that Bhakti and Jnana are not only reconcilable but always go together-is the prime object of this great text. 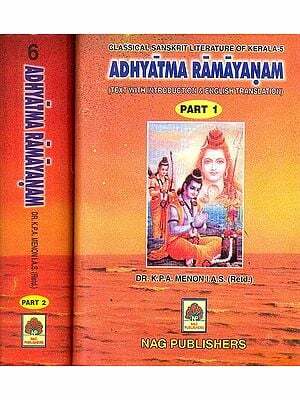 In order to achieve this objective, the Adhyatma Ramayana, while sticking to the main trends and incidents of the Rama Saga described in Valmiki's epic, makes various deviations here and there in the course of its extensive narration. To cite a few such examples: In the Adhyatama Ramayana, Rama at his very birth, reveals himself as the fourhanded Mahavishnu. Rama's departure to the forest is only of his own making, and the intrigues of Kaikeyi and Manthara are only external pretexts brought about by his Maya. The Sita who is abducted by Ravana is not the real Sita but an illusory double of hers. The real Sita is hidden by the Fire-deity. And finally at the end of the Yuddha Kanda Sita's entry into fire is only a ruse to take back the real Sita from the hands of the Fire-deity. Ravana, Kumbhakarna etc., know the spiritual identity of Rama, and are only seeking death at his hand, as a means for salvation. They know that 'devotion through confrontation' is a quicker path than that of Bhakti of the ordinary type. These are only a few striking deviations: there are many more of this type scattered all through the text. All these deviations are meant for preserving the Supreme status of Rama in the eyes of the devotees. More of such deviations are listed in the Appendix. 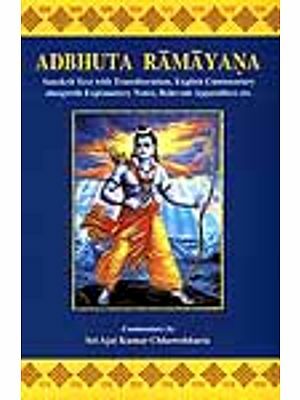 Another feature which distinguishes the Adhyatama-Ramayana is the large number of hymns sung by the various personages entering into the narrative as also the many philosophical discourses that are spread in various parts of the text. Besides teaching fervent devotion, these give a very simple and non-technical but profound exposition of the doctrine of non-dualism. 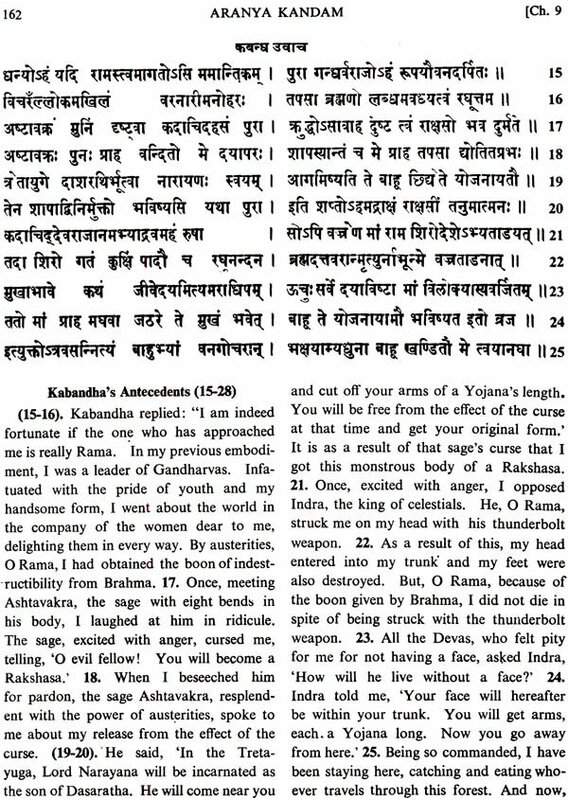 This is a deviations from Valmiki's epic which contains no such hymns and discourses. On the whole the general scheme of the text seems to follow the pattern set by the Bhagavata Purana in dealing with the life of Sri Krishna in its 10th Skandha. The aim of the Bhagavata Purana is declared in its dictum-Krsnastu bhagavan svayam-Krishna is really the Bhagavan Himself. 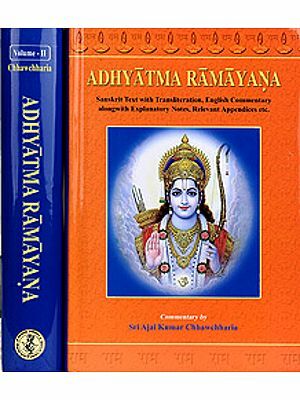 The Adhyatma Ramayana seeks to provide the followers of the Rama cult with such an incarnation that is not merely a manifestation but is identical with the Deity Himself. This is achieved by Rama revealing himself as the four-handed Mahavishnu at his very birth, a feature that is not seen in Valmiki. It is for the achievement of this that many of the deviations from Valmiki are made. In most of the deviations, either whatever human imperfections there might be in Rama are explained away or are made to be adopted with his previous knowledge in order to hide his divinity from unregenerate men. For example, the events leading to Rama's exile were super-humanly stage-managed by him, and Kaikeyi and Manthara were merely instruments he used to give the events the form of a court intrigue. The Sita who was abducted by Ravana was only a double and not the real Sita. Rama's weeping for Sita is expressly declared to be a mere assumption to look human in the eyes of men. The same object of deification of Rama is achieved by the numerous hymns addressed to him by the sages like Vasistha, Parasurama, Bharadwaja, Agastya, Atri, Swayamprabha and others. The example of the Bhagavata Purana is very closely followed in respect of these hymns. They are couched in highly devotional language and all the attributes of the Supreme Deity are used for addressing Rama. Many of them are Advaitic in their philosophic content while their tone is intensely devotional. They again and again establish the doctrine that non-duality is the Supreme Truth but the way to its realisation is through devotion and divine grace. Without these, mere intellectualism will never bring spiritual illumination. Thus this great text seeks to reconcile Jnana and Bhakti as the obverse and reverse of an identical spiritual discipline, and being a text of the Rama cult, Rama is held forth as the Deity to be adored by those who seek salvation. The Adhyatma Ramayana must have powerfully influenced the Ramayanas that came afterwards in regional languages. Though they all took Valmiki's great epic as the main source, the spiritual turn given to it by Adhyatma-Ramayana is reflected very strongly in the Ramayana of Tulsidas. While it is very doubtful whether it influenced Kamban's well-known Ramayana in Tamil, Ezuthachan's Ramayana, considered one of the greatest literary works in Malayalam, is a lose translation of it, with its poetical and devotional excellence enhanced by that great literary man and Bhakta, giving to it the freshness of an original, inspired work. A word in conclusion about the literary side of the text will not be out of place. Its poetry does not come anywhere near the epic grandeur of Valmiki but yet it is a text with considerable literary beauty and is couched in easy yet lucid Sanskrit with a highly devotional tone. Its authorship and date are unknown. It is purposeless to enter into the pure guess-work that modern scholars indulge in regarding these maters. However relevant it may be for scholarly purposes, it is of no use for those who approach the text from the devotional point of view, just as counting the number of leaves on a mango tree is for one going to an orchad for eating mangoes. 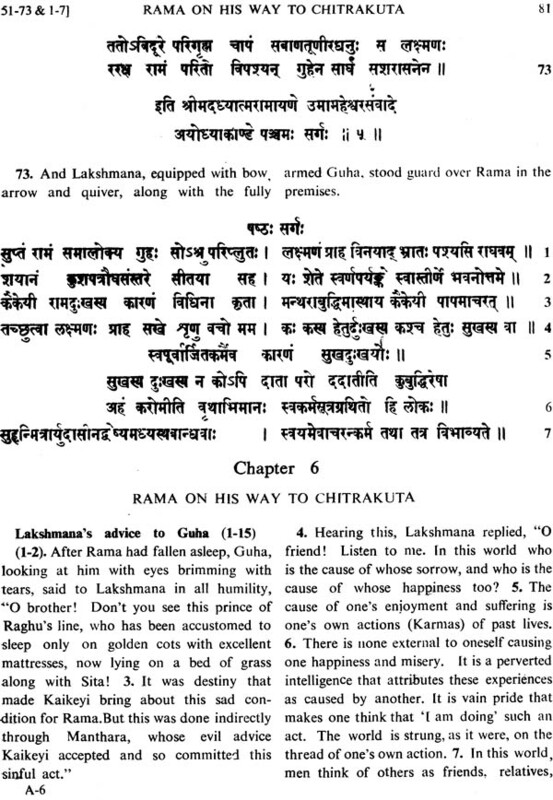 Valmiki's Ramayana was composed by that sage himself on the advice of Brahma. Thus advised, the sage through meditation recovered the whole history of Rama, composed a great epic on it in the Sloka form that he himself had devised, taught Lava and Kusa to recite it in a musical manner, and thus publicized it in the world. The traditional origin of Adhyatma Ramayana is quite different from this. It is a part of the Brahmanda Purana beginning from the 61st Adhyaya (chapter) of the first part of that text. Of all the Puranas, Veda Vyasa is the traditional author, and we can therefore attribute the Adhyatama Ramayana to him. 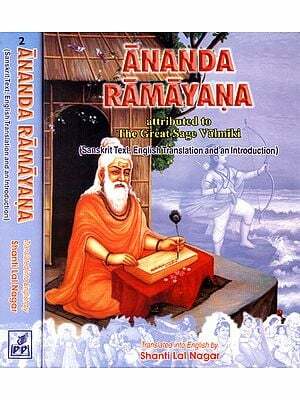 There are, however, some modern scholars who guess saint Ramananda of the 14th century to be its author. 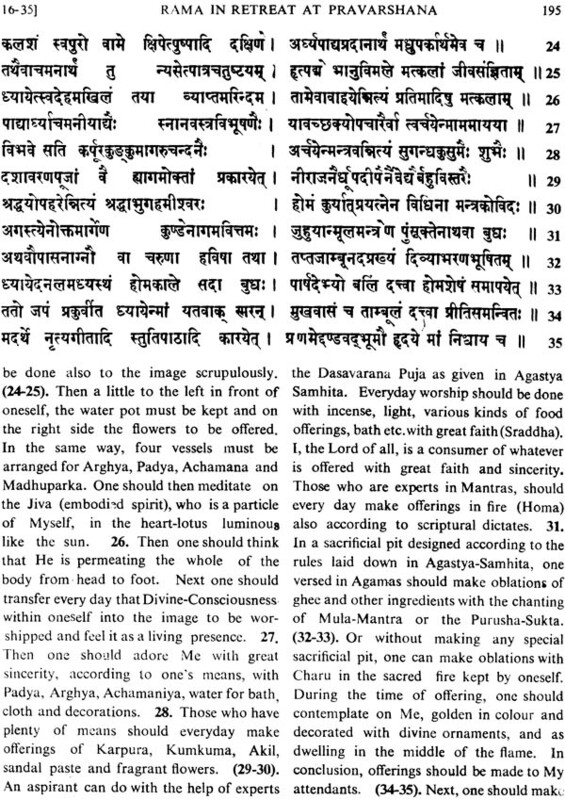 Excluding the Uttara Kanda, it consists of six Kandas with 56 Sargas (chapters) comprising about 3643 verses. We have translated only these six Kandas, excluding the seventh chapter called Uttara Kanda, as it seems to be extraneous to Ramayana proper. 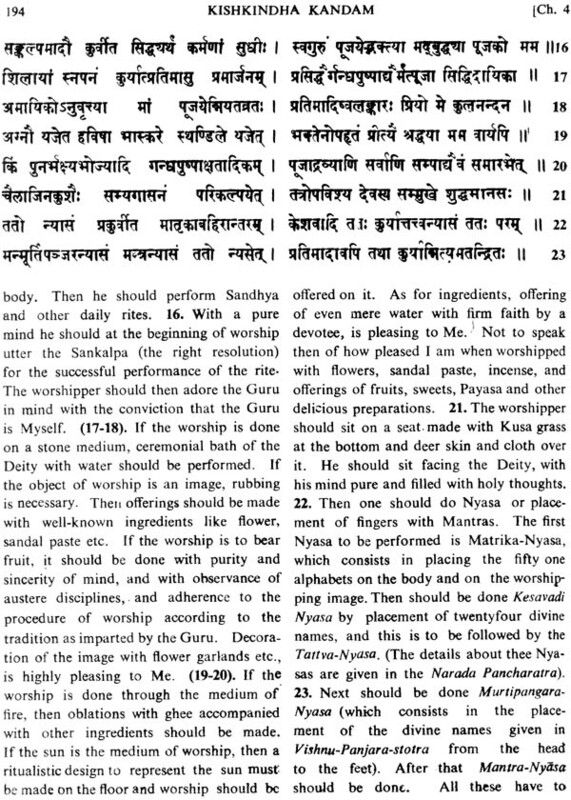 The text is in the form of a conversation between Siva and Parvati, which is reported by Brahma to Narada. Though thus the traditional origins of these two Ramayanas are different, and though there are differences in the treatment of the subject, it should not be supposed that there is any contradiction between these. Both of them deal Adhyatma Ramayana has done is only to make explicit what Valmiki has taught implicitly and indirectly in his great epic. As a much smaller text than that of Valmiki and complete in itself, it offers the devotees of Rama a smaller and directly devotional exposition of Rama's greatness which they can use in their daily practice of devotion. 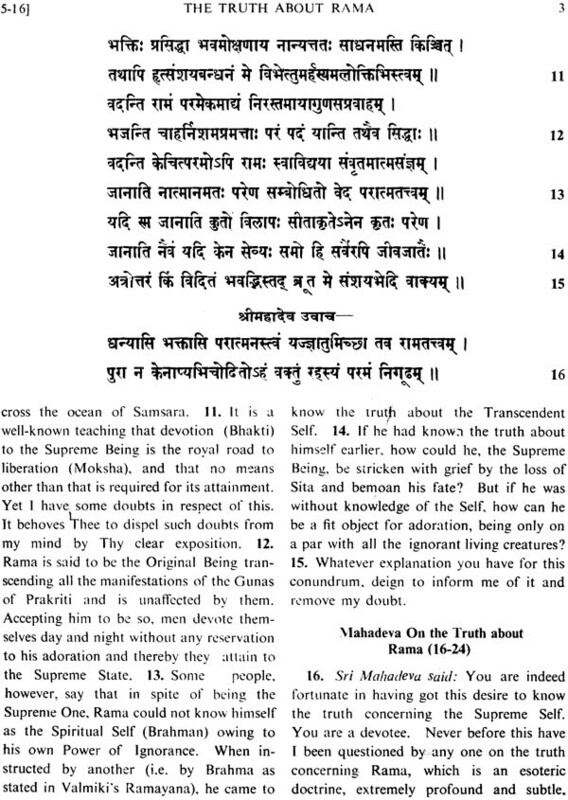 In conclusion it may be pointed out that Bhagavan Sri Ramakrishna refers often to Adhyatma Ramayana in his talks, thus drawing people's attention to the devotional importance of this text.